Using Vista Home Premium version and powered by a 2-GHz Core 2 Duo T5750 processor, Sony VGN-NR485 is a feature-rich machine priced at a reasonably low rate. This laptop is highly ranked as it has earned a score of 75 of WorldBench 6 tests which is no mean feat. Sony VGN-NR485 measures 14.2-by-10.6-by-1.5-inch and features front-mounted SD and Memory Stick slots, four USB ports, and an ExpressCard/34 slot. 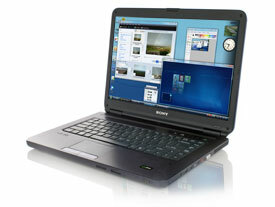 With its Core 2 Duo T5750 processor, Sony VGN-NR485 is fast enough to handle almost any application. The overall performance is stable and reliable. This new laptop weighs 6.2 pounds and it comes with a standard (not high-definition) DVD burner, a 200GB hard drive and a high-gloss 15.4-inch screen. The display quality is satisfactory, bright and it has an easy-to-read 1280-by-800-pixel resolution. The built-in battery can last for approximately 4-hour before the next recharging. The keyboard for this laptop is rather shallow. But if you don’t mind the short stroke, the spacious keys can be rather enjoyable to use. Other shortcoming include its inferior stereo speaker and integrated Intel graphics chip. Selling at $849, it is a good bargain for users who budget below $1000 for a new laptop which has all the necessary features for general use.